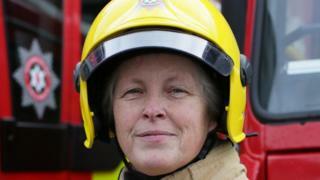 Northern Ireland's first female firefighter has been honoured in the New Year Honours List. Heather Smart was appointed a Member of the Order of the British Empire (MBE). The oldest person from across the UK to receive an award is Robert Lingwood, 100, a World War Two veteran from County Tyrone. Ulster Unionist MLA Andy Allen, who lost his legs in a bomb while serving in Afghanistan, is also honoured. Former Northern Ireland and Manchester Utd goalkeeper Harry Gregg and former British and Irish Lions captain Willie John McBride both feature on the list for a second time while Northern Ireland and Rangers defender Gareth McAuley is also honoured. Ms Smart, from Ballyclare, County Antrim, became the first woman to work as a firefighter in Northern Ireland when she joined the then Northern Ireland Fire Brigade in 1991. She retired earlier this year after 27 years service. Ms Smart has been recognised for her role in advocating a career in the fire and rescue service to women. The Northern Ireland fire service now employs 62 female firefighters. She said she was "excited" to receive the honour, but that it was "hard to take in". "I think because I was the first female firefighter that made an impact, it let other people see that they could do the job," she added. "If you have the physical ability, if you have the right frame of mind, you can do the job. "It was really letting other women know that they can do this job too, and I hope I did that." Alan Walmsley, interim Chief Fire and Rescue Officer at the Northern Ireland Fire and Rescue Service said Ms Smart "was a passionate advocate and ambassador for female firefighters" and the award was a "fitting recognition". Ulster Unionist Andy Allen has become an MBE for services to veterans and their families in Northern Ireland. He is an MLA for East Belfast and a former Royal Irish Regiment soldier. He was 19 when he had his right leg blown off and left leg badly injured by a makeshift bomb while on patrol in Afghanistan in 2008. Mr Allen said he felt "humbled and privileged" that he had been put forward for the honour. "I see this honour as being very much in recognition of my colleagues and volunteers at AAVS (Andy Allen Veterans Support)," he said. "They are the individuals who work very quietly behind the scenes and make things happen, because if it wasn't for them then this honour would not have come to fruition. "My family have also been immense from the day and hour I was injured in Afghanistan, right through to the present day." Ulster Unionist leader Robin Swann said: "The award of an MBE is further recognition of the selfless work that Andy does on a daily basis for the betterment of others, and it will be the source of great pride amongst Andy's friends and colleagues in the Ulster Unionist Party and far beyond. He truly is an inspiration to us all." The former head of the Prison Officers Association, Finlay Spratt, has also been appointed MBE for public service and charity. Children's writer and storyteller Liz Weir has been appointed MBE for services to the arts and education. Others recognised in the honours list include a number of Northern Ireland sports stars - past and present. Former Ireland and British Lions captain Willie John McBride is now a Commander of the Order of the British Empire (CBE) for services to rugby union. Mr McBride, who previously was appointed MBE, played 63 Tests for Ireland including 11 as captain, and toured with the Lions five times finishing with 17 Lions Test caps. He captained the most successful ever Lions side, which toured South Africa in 1974, and said he was "absolutely thrilled" with the accolade. "It is lovely to be remembered after all this time, because I have not been involved with rugby for a long time," he added. "To me, the Everest of my career was captaining the Lions in 1974, when we had that unbeaten run against the Springboks and beat them for the first time ever in a test series. "I would like to think this honour would be shared with those guys, because they were absolutely terrific. "Sometimes I felt that I had travelled with 29 brothers." Former Northern Ireland and Manchester United goalkeeper Harry Gregg was appointed OBE, adding to the MBE he was appointed in 1995. Mr Gregg survived the 1958 Munich air disaster and was praised for staying with the burning plane to help passengers to safety. He made more than 240 appearances for Manchester United during his career. Northern Ireland and Rangers defender Gareth McAuley has become an MBE for services to football in Northern Ireland, while Crusaders FC manager Stephen Baxter received a British Empire Medal (BEM). Former Irish Rugby Football Union (IRFU) president, Andy Crawford, was also appointed MBE.